Appearance: Brown background with large potash feldspar crystals (15-30mm in diameter), surrounded by greenish plagioclase circles. 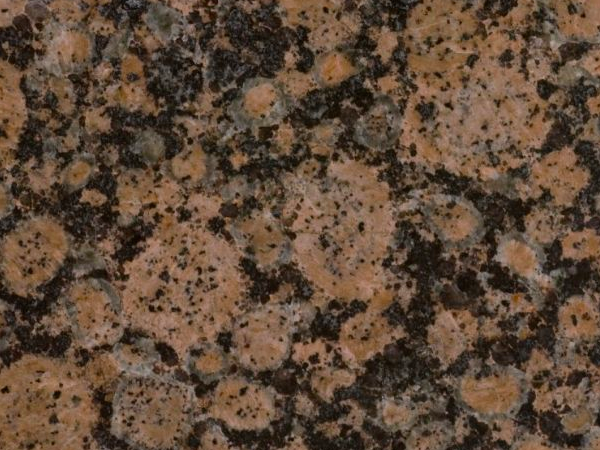 Properties: A coarse-grained, non-foliated, brown viborgite granite. Colour variations may occur to some extent, even in the same batch. It is recommended to seal this stone to extend its longevity. This granite is frost resistant. Use: Due to its excellent wear resistance (class 5), this natural stone is suitable for all internal and external uses, including floor, kitchen worktops and other bespoke stonework in private and public environments, even with intensive traffic. Finishes: Polished, honed, sand-blasted, flamed, brushed and custom-made finishes.